"Fret no more as Should I Remove It? will help you identify what is worthwhile to keep and what needs to be trashed." Featured download of the day "a helpful tool when you decide whether you're going to keep a program." A must have, Reason Antivirus. Privacy threats are powerful, you need a powerful antivirus to prevent them. That’s where Reason steps in: a next-generation antivirus that Protects not only your digital devices, but also your privacy. "Should I Remove It? explains what those mysterious processes are in the Windows task manager, shows you what those unlabeled apps are in your programs list, and lets you know if they're safe to stop, uninstall, or delete, all with a single click." The top 10,000 installed programs. Clean and remove unwanted PC programs. 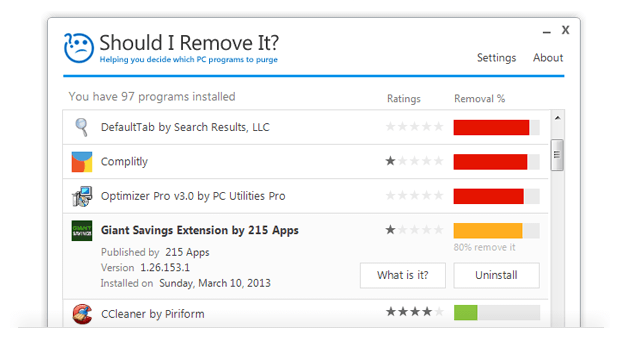 Take the guesswork out of removing unwanted PC programs. Ever open up the Windows Add/Remove Programs app and are just utterly overwhelmed? Well, don't worry, we are here to help. Quickly locate and remove unwanted programs including adware, toolbars, bloatware, crapware and other junk. Download the free Should I Remove It? software and within seconds purge your PC of crapware. "a must-have tool for anyone looking to tidy up their machine." What is Should I Remove It? Should I Remove It? is a very simple but extremely powerful Windows application that helps users, both technical and non technical, decide what programs they should remove from their PC. This typically includes finding and removing all sorts of crapware and bloatware such as adware, spyware, toolbars, bundled unwanted applications as well as many forms of malware. The program is very lightweight and extremely fast. Should I Remove It? simply scans your computer for all its' installed programs and then ranks what should be removed by leveraging the wisdom of the crowd (and of course our technical experts) to determine what should not be installed. Bloatware and trialware refer to PC manufacturers' habit of loading crippled versions of commercial software on a new computer in the hope that some will upgrade to paid editions. How to remove manufacturer bloat? The Mindspark FreeRadioCast toolbar for IE will add unwanted search, newtab and search assets in Internet Explorer. The W3i screens saver is bundleware and will install additional adware and unwanted software on installation. This toolbar will install in your web browser and inject a new search, homepage and newtabs while redirecting searches to a Perion owned search feed. This Yontoo plugin is an adware program that displays pop-up ads and unwanted advertisements on web pages that you visit. This browser plugin uses a Visicom search feed and is designed to redirect a user's web searches. yessearches is a web browser search hijacker that modifies the assets of the user's web browser in order to redirect search results. istartpageing from ELEX is a web browser search hijacker that modifies the assets of the user's web browser in order to redirect search results. System Healer Tech Sp. Zo.o. This is an Ask.com toolbar that install the As.com or mywebsearch home and search providers in the browser.